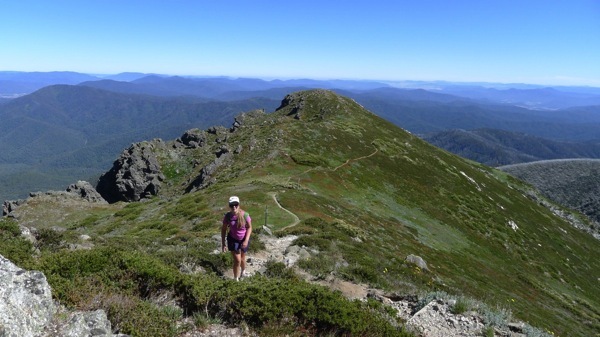 The end of the year usually involves an epic walk of some form and 2013 was no different with a plan to try a new route off Mt Bogong, Victoria’s highest mountain, across to Bogong Village. 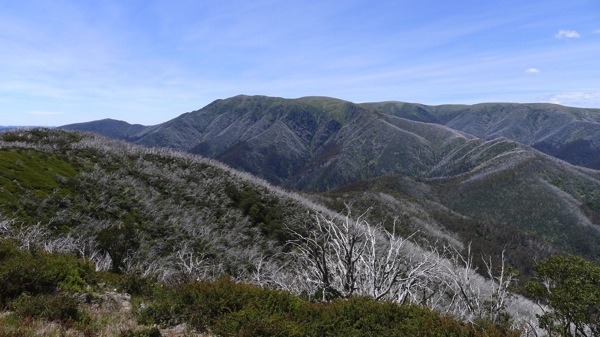 My oldest daughter decided to join me for the walk, not quite knowing what she was getting herself into it, although I had quoted the Wikipedia page for Mt Bogong to her: “The Staircase Spur may be one of the most difficult tracks you ever walk due to its steep slopes“. Parts 1 and 2 were as expected. 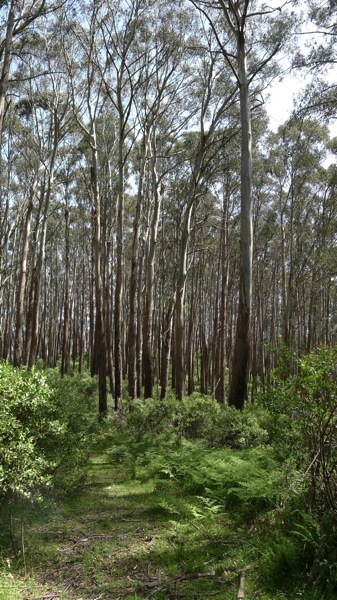 The ascent and descent of Mt Arthur were more challenging, with bush bashing, hungry ants and lots of fallen gum trees… but firstly, let’s rewind to the start of the walk. After 2km of 4WD track from Mountain Creek, the 6km climb up Staircase Spur to the summit is steep and we were impressed to be passed by a man running up the mountain! Bivouac Hut is halfway up the spur and a good stop for morning tea. Above the treeline, the views quickly become panoramic. We reached the summit in 3 hours 45, and this was where we were going to decide to return (via Eskdale Spur) to Mountain Creek if A was too tired to continue with the originally planned walk, but after a good rest at the summit cairn, we decided to continue with the planned route. 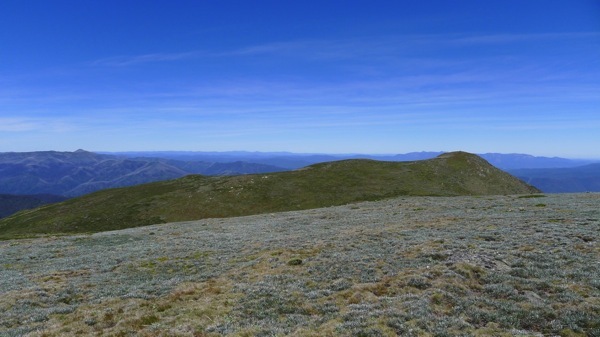 The summit is at 1986 metres and, with glorious weather, there were spectacular views in every direction, including across to Mt Kosciuszko in NSW and west to Mt Buffalo. I have walked the Staircase, Eskdale and Big Spur routes on/off the mountain, but never Quartz Ridge. It is a beautiful walk and aptly named. Bogong Creek Saddle is at the 15.5km mark and we stopped there for lunch; this is a junction with a fire trail and a simple helipad, which consisted of four white tyres marking the corners of a large flat grassy area. At the saddle, there is a small sign to The Grey Hills, and that is where the fun begins! The climb up to the top of Mt Arthur is just under 1.8km, but has over 300m of climbing on a track that is very overgrown in places and hard to follow at times. There were also ants everywhere: if we stopped, our shoes were quickly infested with small, stinging ants; good motivation to get the top as quickly as possible! 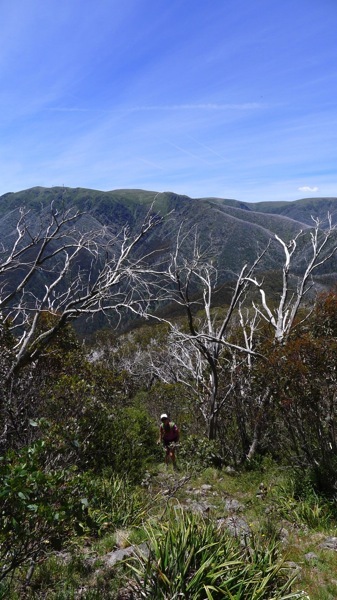 At other times, the track was easy to follow, and overall it was a nice climb, with greats views of Mt Bogong behind us. The soak in the Kiewa River at the end was divine! Not so divine was the closed general store – we had been lusting after icecreams and cold drinks for a couple of hours, only to be seriously disappointed to discover that the general store has closed. Total distance was just under 26km in 7 hours 22. There is limited water on the route: apart from the tank at Bivouac Hut and the faint stream near the saddle, there is no other water unless you detour (eg. to Cleve Cole or Cairn Creek huts). This is a remote walk, with limited phone coverage and few people: we saw no-one after Staircase Spur. We carried a PLB (thanks Ian!) and strongly recommend you do the same. 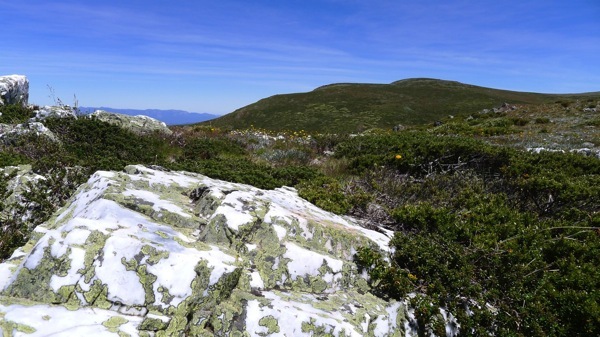 The track over Mt Arthur is overgrown and the signpost near the summit is damaged. 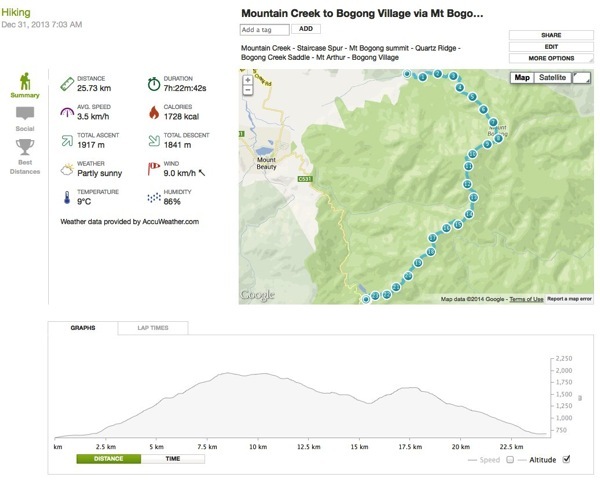 You will need a good map (such as the Spatial Visions Bogong Alpine Area 1:50,000 map) and a GPS and/or compass. As with any summer alpine walk in Australia, take heed of bushfire warnings and be prepared for sudden changes in weather. Here is a screenshot of the route and stats from the day; the Endomondo workout page has the route and more details (but it does require you to log in to Endomondo).